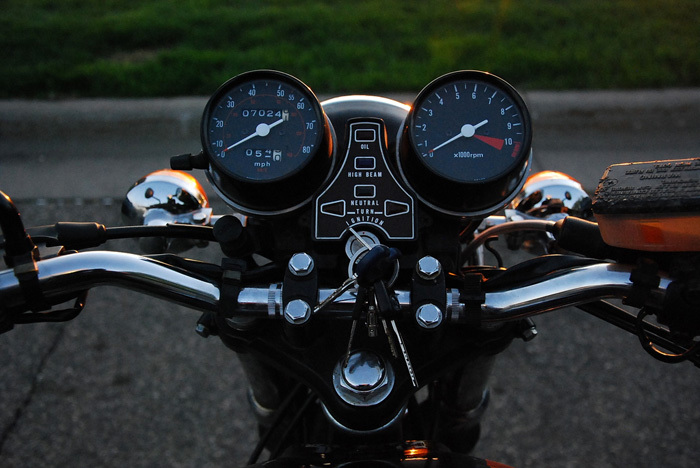 May 16, 2011 — Over the past couple weeks, I’ve been spending a lot of quality seat time on my wife’s motorcycle. Honestly, I have a lot of trouble not riding her bike. I can’t stay off of that little machine. Last weekend I did 100 miles around town in a single day. When I brought the bike home, I wrote about how I’d thought that if I had a bike of my own like hers, I’d probably never touch my Vespa again. I’m now more convinced of that than ever. This particular bike, like my wife’s Honda, is a motorcycle in need of healing. The top end has some issues. Someone rebuilt the engine and routed the cam chain incorrectly. He tried to start the bike, where it of course made a horrible noise and so he stopped. Jeff (of Bluecat Motors fame) and I will tear into that motor this week to see how bad the damage is. Best case scenario, the chain simply needs to be re-routed. Worst case, it’ll have bent valves and/or ruined pistons, stripped cam gears, and other horrific internal damage that we’ll have to rectify. Actually, that’s part of the fun, as far as I’m concerned. A simple fix would be best, but if it’s a complete tear down, that’s fine with me! The more I know about these old bikes the better. However, to do this bike, I’m going to have to sell my Vespa. There’s a rash of scooter sales in the Salzman house right now, actually. My wife loves her bike so much (which I can’t blame her) that she’s selling her scooter as well. She simply doesn’t ride it. I’m not riding my Vespa either. We can’t both ride her bike, and my GL is more of a long-term project (and not a great city bike), so I need a city bike of my own. The CB450 will be great. It’s classic. It’s racy. It’s even already customized with a magnificent Vinyl-Lux custom seat and low handlebars. All it needs is the motor sorted out and its blinkers tucked in. But that will mean the end of an era. I’ll be without a scooter for the first time since I started riding two-wheelers in 2007. In one sense, I’m really sad about that. I want to keep my Vespa on principle, but it just wouldn’t make sense. It’s not fair to the machine if it just rots in my garage. What’s more, it’s a fabulous machine that someone else should enjoy. Also, it doesn’t make a whole lot of sense to have two bikes (the CB450 and the Vespa GT) with basically the same performance. In the long run, selling the Vespa actually opens me up to a smaller scooter. I could take a three tiered approach to my riding stable. A small scooter for slow speed, strictly ’round town stuff. 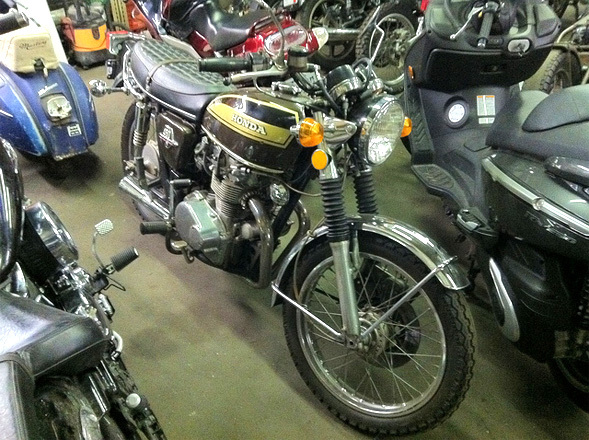 Then the CB450 for mid-range city and day-to-day country riding. Then the GL1100 for long trips and bike shows. I’m not sure exactly which scooter I’d bring into the stable, but there are a lot of great possibilities. I could go vintage Vespa or Lambretta. I could finally nab the Honda Elite that I’ve always told myself I have to own someday (because as a kid, it was seeing a Honda Elite that planted the seed of wanting to ride). I could also nab any number of upcoming all-electric scooters. That’s particularly appealing. Either way, it’s the end of an era. I know that as soon as the Vespa leaves my garage, I’ll have my eyes open for another scooter to fill that gap. I’m not sure when that will happen, but ownership or not, I’ll always be a scooter fan. No matter what though, I’m going to keep riding, keep building bikes and keep building a collection. I’ll also keep writing about my riding escapades here, so stay tuned. Wow, no scooters in the Salzman garage! What has happened to you? Buuuut … we can ride the big boys now (well, if I ever get my moto back haha). Haha, I’ve been eyeing that 450 in the BlueCat shop for a whole season now, good buy! Are you consigning your scoots through them? Where are they for sale? For now, I’m selling them privately. My wife’s Buddy is for sale here. My Vespa is for sale, technically, but it isn’t listed anywhere yet. Waiting to sell the Buddy first. I’m excited about the CB450 DOHC to be sure. Jeff and I did tear into the motor and thankfully it looks like the engine is fine. We had to cheat the exhaust cam forward one tooth to get the timing correct, but both cylinders had full compression when we finished. That should mean that the valves are unbent and the pistons are undamaged. What’s especially fortunate is that the engine had just been rebuilt when the mistake happened, so with a bit of work, I’ll essentially have a brand new old bike. It needs a handful of gaskets, some wiring hooked back up, and its control cables shortened for the new handlebars. The air boxes are missing and the carbs likely need a full rebuild. So it’s hardly rolling yet. Shortly though, fingers crossed.